The wisest of sages and most knowledgeable of researchers are aware of realms outside the Light World, but know little of them. The handful recorded here are the most renowned, but are believed by some to be only a small drop in the infinite ocean of realms that fill the cosmos. The study of outer realms, and how these realms are connected to the Light World, is known as "astrology." Hyrule, Termina, the Great Sea, and Subrosia are all part of a realm usually called the Light World, and occasionally referred to as the Material Plane. This is one dimension, or one plane, out of numerous partially-overlapping realities. The Light World itself takes the form of a colossal globe floating in a seemingly endless space filled with stars. In modern times, its surface is dominated by the Great Sea which itself is dotted with numerous landmasses, most prominently the continent often referred to as Hyrule. It is believed by some that inner realms, or "extraterrestrial realms," include those which are physically connected to the Light World by space and air, but not by solid matter nor oceans. According to this belief, the moon and the stars are all different "inner realms" not terribly unlike the Light World. Relatively few Hyruleans have faith in this theory, however. The moon as it appears in the night sky of Hyrule. According to legend, the moon was once a pure white circle that hung in the sky. Centuries ago, this appearance was changed through the influence of a great evil to take the monstrous, foreboding face it now bears. Some today believe this legend to be a compelling argument that mortal beings can physically fly to the moon, and that is but one of many extraterrestrial realms that exist beyond where the skies end. The surface of the moon, according to astronomers, appears to be barren. There are some Hyruleans who believe that the moon, as an inverse of the Light World, has barren earth on its surface and abundant life on the interior. The realms described below have only vague and supernatural connections which are less clear-cut than those of the moon and other supposed extraterrestrial realms. It is unknown if any force other than magic spells can facilitate travel between these realms and the Light World. In this setting, the Astral Realm replaces the Astral Plane. The Astral Realm contains little if any physical matter; it is said to be the dimension of thought and dream, and some Hyruleans believe this is where spirits go when waiting to be reborn. It is a great, silvery sea of clouds, the same above and below, with swirling wisps of white and gray streaking among motes of light resembling distant stars. Erratic whirlpools of color flicker in midair like spinning coins. 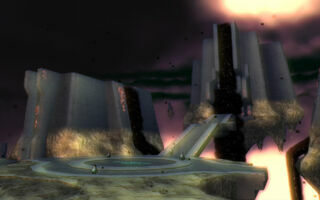 In this setting, the Dark Realm replaces the Shadowfell. the Triforce once illuminated the Dark World. As its name implies, the Dark Realm—or Dark World—is a hellish reflection of the Light World. Of the known outer realms, it is the most infamous. It is said that in ancient times, when hylians wielded stronger magic than they do today, the most heinous of criminals were banished to this realm to never return. The geography of the Dark World in many ways eerily mirrors that of the Light World. Instead of a blue sky, it bears an eternally dreary brown sky filled with dark clouds. Where a beautiful lake exists in the Light World, a toxic mire exists in the Dark World; where the Light World has a serene forest, the Dark World has woodlands flooded with skeletons and monsters. It is said that Light Worlders who enter the Dark World are transformed into monsters or anthropomorphic humanoids, with the new appearance representing the truth of the creature's soul. For example, an innocent philanthropist might transform into a pink bunny; a courageous warrior might be a fierce wolf; and a thief or murderer might transform into a hideous beast. Those born in this world retain their race's normal appearance, however. It is rumored this land even contains hylians who have their own, separate kingdom from Hyrule. Ganon himself is said to have either been banished here or born here, depending on which rumors are believed. A particular conspiracy about the Dark World is commonly known, but seldom believed. According to it, when the Golden Goddesses created the Light World, they also created a plane then known as the Golden Land. This realm had golden skies, and instead of a sun its beautiful landscape was illuminated by the Triforce which hung high in the sky. At some point in the distant past, Ganondorf fought his way into this realm—either by intention or because he was the first criminal banished there—and took hold of the Triforce. The golden power, reflecting the darkness in Ganondorf's heart, twisted the Golden Land into the vile hellish landscape it is today. It is this man who, through the Triforce, would become the monster now infamously known as Ganon. supposed monarch of the Fairy Realm. In this setting, the Fairy Realm replaces the Feywild. The Fairy Realm is a mysterious dimension, from which fairies are said to have originated. The realm is said to be flooded with endless woodlands, populated by fairies, giant insects, and many creatures as wondrous as they are bizarre. It is rumored to be eternally ruled by the Fairy Queen, a peculiar entity that is said to simultaneously invoke innocence, fear, and power. One depiction of the fabled Sacred Realm. The Sacred Realm is said to be a holy plane barely connected to the Light World, and the only realm believed to be an artificial creation. According to legend, it was fabricated by ancient sages in service to the Kingdom of Hyrule, and created solely to keep the Triforce out of evil hands. The Sacred Realm is on a smaller scale than most true parallel realms. As the legend goes, the sages created an impenetrable "Temple of Light" at the realm's center, guarded by their immortal souls, to prevent the Triforce from ever being used and abused. It is unknown perhaps to any but those sages if anything in that realm exists beyond the Temple. By design, the Sacred Realm—if it exists—is virtually inaccessible. Some Hyruleans believe the Sacred Realm was destroyed, or never really existed, and its rumored existence is just a ploy from the Royal Family to dissuade the populace about the supposed true fate of the Triforce. In this setting, the Silent Realm replaces the Ethereal Plane. Instead of a truly separate realm, the Silent Realm almost completely mirrors the Light World. All of its geographical features are nearly identical, and plants such as trees and grasses are mirrored within it. The most stark difference, however, is that it has none of the Light World's creatures. Instead, the realm is filled entirely with bright white creatures called silent guardians and silent watchers, which seem to eternally stand watch over the realm. When a foreign creature enters this realm, the silent guardians abruptly spring to life and seek out the violent obliteration of whatever foreign entity has unfortunately found its way into their realm. The purpose of this realm and its guardians is unknown, but through fables the realm's existence has become fairly renowned across Hyrule. Supposedly bad children will get sent here for not obeying their parents; others believe that those who live a "bad life" are imprisoned in the body of a silent guardian. As its name implies, the Silent Realm is normally dead silent—the guardians make no sound, and little else is around to make a noise. The realm seems to be drained of color, as everything appears several shades closer to a pale, lifeless blue. Everything is dimly lit by a light source which seems to have no origin. A palace in the Twilight Realm. This realm features landmasses devoid of flora and fauna that seem to float in an eternal abyss of endless twilight. The air is filled with coarse bits of pitch-black substance which seem to flicker in and out of existence when creatures pass through them, and the force of gravity seems to be slightly less than that of the Light World. This realm is populated solely by the twili race, which themselves were said to reside in the Light World thousands of years ago. The twili themselves only seem capable of surviving with the powerful magic of their race, as there are otherwise no resources to facilitate their survival. Some believe the Twilight Realm was an artificial creation for or by the twili, and the landmasses within it were also somehow once part of the Light World, before centuries of decay turned them into what they are now.